Enjoy a 3-hour cruise around the Raritan Bay on New Jersey's Official Tall Ship! - June 19 - 21 ~ The History Girl! 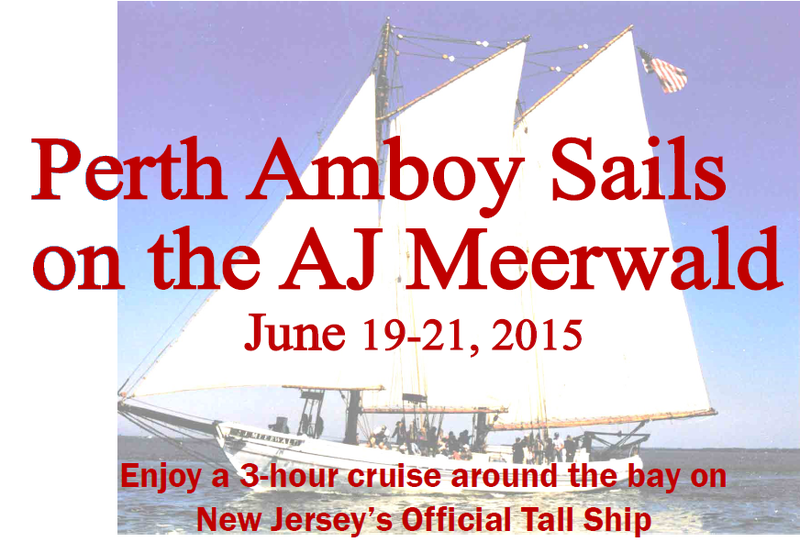 Enjoy a 3-hour cruise around the Raritan Bay on New Jersey's Official Tall Ship! From June 19 - 21, 2015, enjoy a 3-hour cruise around the Raritan Bay on the AJ Meerwald, New Jersey’s Official Tall Ship. Thursday, June 18 - Open deck reception to welcome the Meerwald to Perth Amboy. Friday, June 19 - 1:00 pm Sail: Raritan Riverkeeper Bill Schultz will point out landmarks in Perth Amboy, South Amboy, and Staten Island, and trace development of Bayshore towns and industries, and the impacts on the estuary. $45 per person. Friday, June 19 - 5:00 pm Sail: NJ singer-songwriter Christine DeLeon performs songs of the sea and other music. $65 per person. Saturday, June 20 - 9:00 am Children’s Sail: The crew demonstrates basics about the schooner and sailing, kid-style. $26 per child and $52 per adult. Saturday, June 20 - 1:00 pm Sail: Rutgers scientist Dr. Beth Ravit tells the story of the Eastern oyster, which thrived in the NY/NJ Harbor until the early 1900s, and explains the NY/NJ Baykeeper’s current efforts to reintroduce this important species to the estuary. $45 per person. Saturday, June 20 - 5:00 pm Sail: Local folk singer Spook Handy returns to provide musical entertainment as the sun sets. $70 per person. Sunday, June 21 - 9:00 am Sail: Fathers’ Day pancake breakfast served by the ship’s crew as you sail around the bay. $50 per person. Sunday, June 21 - 1:00 pm Sail: Bring Dad out to hear historian Douglas Aumack tell the story of the pirates that once roamed the waters of the Raritan Bay and Arthur Kill, plying their lawless trade. $45 per person. The cruises will depart from the Perth Amboy Marina, 260B Front Street, Perth Amboy, NJ 08861. Reservations must be made by Thursday, June 18. No walk-ups will be accepted. For more information, call 609-341-3246 or visit www.revolutionarynj.org.